It's wet and windy and not very nice out there. The river conditions are ok at the min, but i would expect the river level to rise as the day goes on. Just stay at home. The eden came up quite a lot yesterday afternoon, but has dropped now to a fishable level up here at kirkby with a bit of colour in it. All this could change with a few more heavy showers, but its dry at the min and quite bright. It's raining at the moment with more to come. The rain has found it's way into the eden and it has risen 2 to 3 inches with a tinge of colour in it, but still fishable. Obviously all this could change as the day goes on and there could be more water in below the larger tributaries. Yesterdays rain didn't affect the river level and the weather is cloudy with some light rain at the min. The small amounts of rain have not affected the river levels, which are still good. The weather is quite nice at the min, bright and cloudy. For an up to date eye on what the weather is doing here, click on the weather forecast link on the home page and click on latest/recent past on the right hand side of the met office page and then click on rainfall radar. Its a bit chilly here this morning , but dry at the min. The river conditions are still good, running at an average height for this time of year. There has been no change in the river conditions which are still good and the weather is dry with patchy cloud. As john has pointed out the river level has not changed for a few days and is still the same as before. But it did warm up yesterday, as john asked, so hopefully he will ask the same again today !! At the moment the weather is dry and overcast. Another day of little or no rain yesterday and there's unlikely to be any change in river conditions. However, it would be nice if it started to warm up a little!!! With no overnight rain the river should be unchanged from yesterday. However, there's still a cold breeze so it's worth seeking out the sheltered spots. Another cold day with a fair easterly breeze is likely to make fishing pretty uncomfortable. The river level/colour is unlikely to have changed since yesterday. Some overnight rain has not really changed things. The river is still running at a good fishable level. The sun is breaking through with the promise of bright day. River still at a good level for fishing. Rain likely to hold off. Cumbria has enjoyed an extended run of bright sunny weather recently which is likely to show itself once again today. Intermitent showers have not really put too much of a damper on things. The river is up a little following some rain. However once again the sun is breaking through and conditions look good. April showers can be expected. No change - river still low and clear and very fishable. Although there was an overnight frost the sun is out and there is a prospect of sunny spells before predicted showers later this afternoon. No wind. Cold. Once again the river is low and clear. Very fishable. The weather is cloudy at present but the sun is trying to break through. Cold as usual. Hazy sunshine is clearing a light overnight frost. The river is still running clear at a nice level for fishing. The picture shows how the river looked last night. The river is running at a nice level. It is clear and very fishable. The weather is overcast with the sun breaking through periodically. The temperature remains cold. The river is a little higher than yesterday but it is clear and quite fishable. The weather is a diferent matter. Sun, cloud, showers and possible snow are all forecast. Whatever the weather throws at us today it will remain cold. The river is quite fishable. Anyone prepared to fish in wintry conditions should find conditions quite OK. Rain is forecast for later in the day. 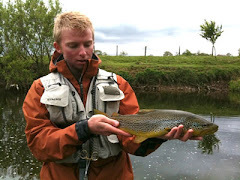 The river is again at a superb level for fishing. Everything looks very attractive with blue skies and sunshine. But it is very cold out there and rain is forecast for later in the day. 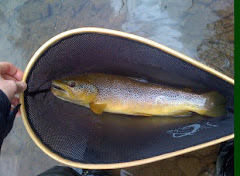 The river is running at a nice clear level for fishing but the weather is very very cold. The banks are white from overnight snow. It is beautiful day at the time of posting. Blue skies and sunshine prevail. It is tempting to be outdoors. A light snow fall occured overnight reminding us that wintry conditions still persist around here but the river is running at a good fishing level. If you like early season fishing today would be a good day to be out - until the weather takes a turn for the worse. There's a dusting of fresh snow on the Pennines this morning. Although the river level should not have changed much (yet) wintry showers are forecast, getting heavier and more prolonged as the day goes on. While there's still the chance of a fish, it may not be the most comfortable experience. The river was looking good yesterday afternoon (although there wasn't much sign of fish or fly). There's been no overnight rain so today should be OK. If you can get to the river today do it - the forecast is for a return to winter over the week end. While Steve's having PC problems this may not be quite as acccurate as normal. The weather's currently overcast but dry & the forecast for today isn't too bad. 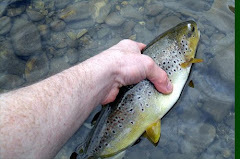 With little rain yesterday and overnight, the river should be getting something like fishable. The higher reaches may offer the best chance again. The rain of the last couple of days has put river out again. 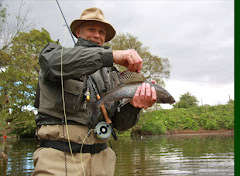 The best chance of a fish is at the top of the river or chasing rainbows at Bessybeck. There has been plenty of rain overnight and the eden is rising . I would expect the conditions to get worse before they get better. It's still raining at the moment.